8) complex and non-ship version of the pile wall construction, corner piles and connectors for accurate installation and construction of circular cofferdam, can be used as a template. Steel sheet piles construction is the most important is to maintain the sheet pile horizontal and vertical straightness, you can use effective temporary measures and guide the framework of the pile at two elevation support to control. The top and bottom guide beams must be rigid for the effect. Temporary works can be temporary H-shaped steel piles fixed to the ground, to prevent the whole frame movement. The height of the upper and lower support points of the guide frame should be increased as much as possible so as to improve the guiding effect and piling accuracy. The long piles may need to be guided in the middle to prevent deflection and avoid the problem that the elongated structure will suffer axial force. 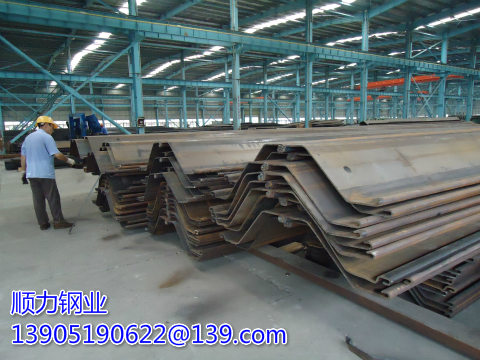 Steel sheet pile installation may be imposed on the direction of a huge horizontal force, so support the guidance of purlin temporary works need reliable design, strong connection to ensure that the construction will not occur in the movement and overturning. In order to prevent the distortion of the steel sheet pile in the guide frame, the free flanges of the type-2 piles and the free webs of the u-piles are to be connected to the surrounding purlin by the guide block or the band hoop. In the water piling, ) Can be secured to the temporary support pile. When construction in seawater and the next guide will be submerged when the tide can be used for the level of steel pipe pile around the purlin to fight sheet pile. The upper surface of the steel pipe ensures that the sheet pile is properly positioned between the purlins. Channel ladder must meet health and safety standards, because there is danger can not be inserted on the ladder sheet pile, channel platform must be installed in the appropriate location to ensure that the entire construction process channel safety. Support frame and walkway must be designed, the guide beam in the pile hit a certain position to be able to move away, leaving only the guide beam control the accuracy of the subsequent piling process.